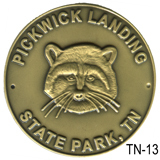 Pickwick Landing State Park was a riverboat stop dating from the 1840s. In the 1930s during the depression, the site was chosen as a location for one of the Tennessee Valley Authority’s dams on the Tennessee River. What comprises the park today was once the living area for the TVA construction crews and their families.